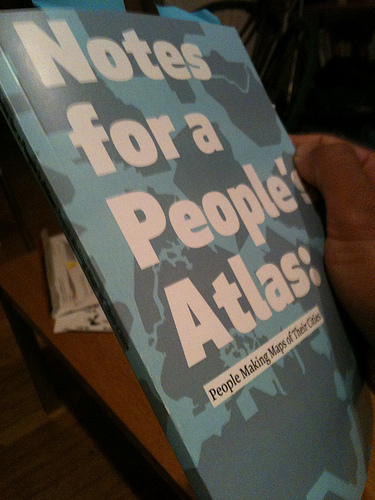 A catalog of the Notes for a People’s Atlas project was published by the AREA Chicago Imprint in November of 2011. You can now purchase the book through Half Letter Press. This 100 page full-color catalog includes essays by Euan Hague, Jayne Hileman, Daniel Tucker and Rebecca Zorach on mapping and traditions in art, geography and political activism. The book includes in-depth documentation of the Note’s for a People’s Atlas project that took place in Chicago. Additional mapping projects Zagreb, Croatia; Syracuse, NY; Greencastle, IN; Portland, OR; Granada, Spain; Waterville, ME; Chisinau, Moldova; New York City, NY; Detroit, MI; Boston, MA; Pilsen; Chicago; Santiago, Chile; London, ON, Canada; Sherbrooke, QC, Canada; Ukraine (the cities of Uzhgorod, Donetsk, Kherson, Simferopol, Vinnytsia); Gary, IN; and Valparasio, Chile.